The controversial striker has reportedly returned to the Borough of New Kru Town to reunite with his boyhood club Monrovia Club Breweries on a half season loan deal. Barrack Young Controller (BYC) have reportedly loaned striker Blamo Nimely to Monrovia Club Breweries following his rigmarole relation with the club’s technical staff. Nimely has found playing time hard since his fabulous transfer to the Barrack Club about three seasons ago. 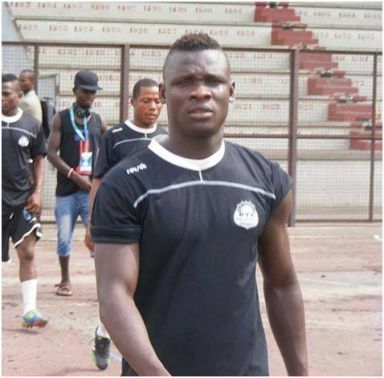 The lad who is one of the local league current generation top scorers was suspended by BYC Technical Director Thomas Kojofrom the squad that flopped in this year’s CAF Champions League preliminary qualifiers for misconduct. BYC technical staff headed by Robert Lartey has complained a lot about the player off-pitch attitude and there are reports that he will be offloaded at the end of his contract which is expected to expire at the end of this season. Nimely has not been seen in the Go Blues squad since the commencement of the 2015 Liberia Football Association top flight league. His capture may, however, mean well for the local alcoholic beverage club(Breweries) who recently saw star player Murphy Oscar Dolley and dependable defender Raymond Fanciah depart the country for greener pasture is Czech Republic.